Basically yes, one VSTi per instrument. There was plans for a HISE player that could load multiple instruments and that may happen in the distant future but isn't currently on the horizon. 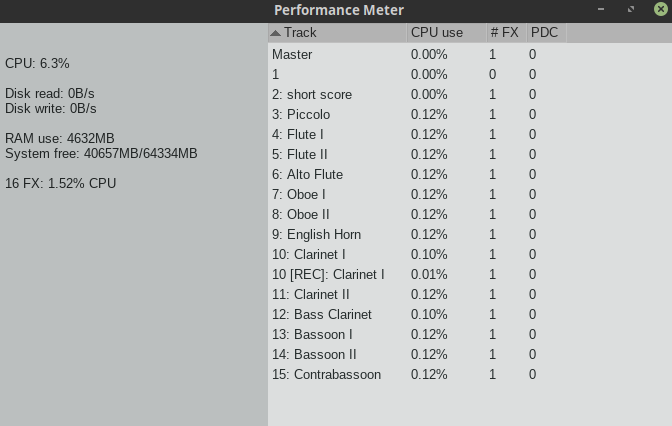 I have a template in Reaper with each of my woodwind instruments and as you can see the CPU usage per track isn't much. @musictop why don't you combine some of them using sample map swapping? @d-healey yes - i was reading your posts and threads about samplemap swapping wich sounds much better, i was anyway planing to start the project from the scratch, since i think i now understand much better how HISE works - so far it was a beginner learning process for me. Love it though - fantastic tool! It's just that i am a musician with very little knowledge about these things and am struggling a bit with scripting and such.